The eTrack all-in-one Practice Management System has all the features you need and is beautifully easy to use. It has minimal setup costs and can be installed locally or used in the cloud. Every staff member has their own licence so they can all be continually logged in anywhere in the world. eTrack has different out-of-the-box configurations specifically tailored to your industry, for example architects, interior designers, quantity surveyors or engineers. The examples shown in this web site are for architects but can be configured for any Industry. Central repository for all work of any hierarchy or terminology. Eg: Issues, Risks, Actions, Calls, Change Requests, Requirements, Tests. Fixed price, Time based, % based, lump sum or any combination. Track Plan, Actuals, Estimates, Forecasts, Variances, Margins and Profits. Track Charge and Costs and define Rate Tables for ease of use. View Graphical Schedules (Plan, Actual and Estimates) with Resource Allocations on one screen. Very easy to create and update schedules. Schedules, Resources and Details all on one screen. Issues, Risks & Assets etc. Define any number of Registers to track such as Issues, Risks, Letters, Enquiries, Complaints, Diary Notes, Requirements or Assets etc. Define your own registers with different parameters. Easy to navigate, filter, sort and step through. In place editing in the Register View. A central, multi user repository for all contacts: staff, clients, consultants, contractors, suppliers, councils etc. 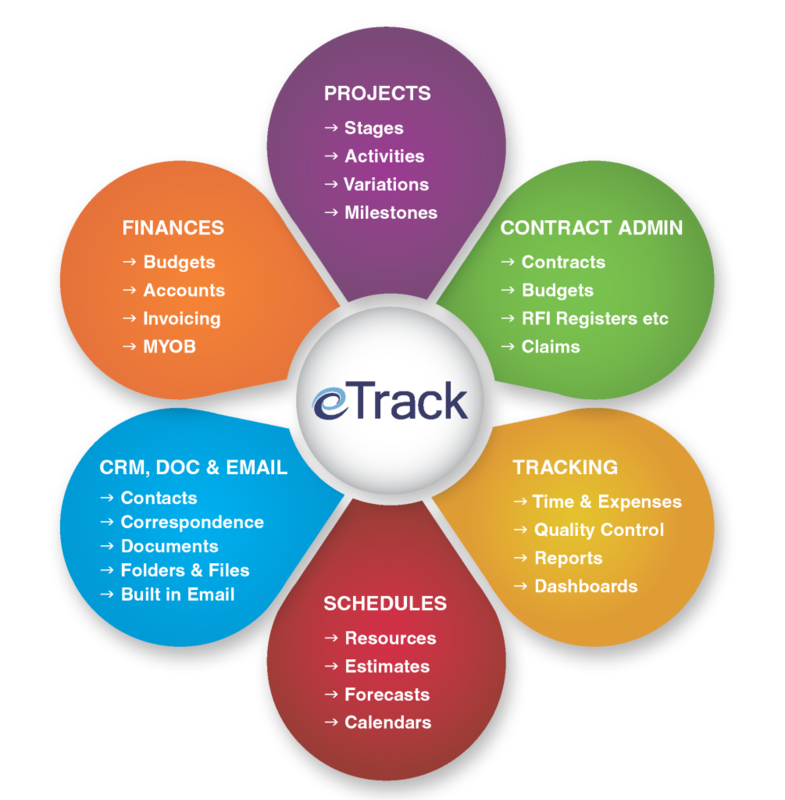 While not a full blown DMS, eTrack includes all the main features needed for managing project documents. Link or embed unlimited files. Version control: check out, edit, check in. Link to workflow to track document progress. View status of documents at any level by project or person etc. The Account Sheet gives a view of all work, resources, time and expense entries, and a journal of all accounting operations. View WIP, charges, costs and profits. Invoices and payments are tracked in the Invoice Sheet and can be printed and exported. Assign invoice numbers and print invoices, either individually or in batch. Design unlimited Excel templates and include eTrack data. Import or manually record payments and receipts. Reporting in eTrack is powerful, customizable, intuitive, graphical and optionally ‘instant’. Build unlimited custom reports with built in Report Writer. View as a table or graphically. 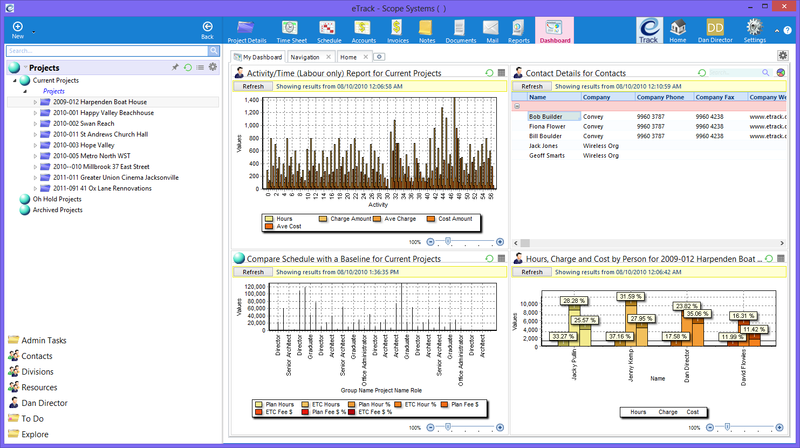 Filter, sort, drill down into reports. Choose to view ‘instantly’ using pre-calculated results. Schedule reports to run and be emailed, eg. nightly exception reporting.